Cauliflower is a versatile vegetable but you may end up with more than you can use at one time. Whether you are growing it in your garden, found it on sale, or can't use up a whole head, you need a way to keep it from going to waste. Freezing is the best way to preserve cauliflower. It doesn't dehydrate well, and it will lose nutrients and get mushy if you pressure can it. You don't want to just pop it into a ziplock bag and toss it into the freezer. Giving the cauliflower florets a quick blanching in boiling water before freezing them ensures that they will retain a good texture when you get around to cooking with them. After blanching, freeze them initially in a single layer. This prevents the cauliflower florets from clumping together after you place them into freezer bags or containers for frozen storage. The fact that they stay loose is a big advantage when, for example, you have a quart container of frozen cauliflower but only need to take out a cup of it for a recipe. Here are the easy steps for freezing cauliflower. Soak the whole cauliflower for a few minutes in water to get rid of any dirt or garden bugs. Chop the whole cauliflower head in half. Cut out the solid stem section. After that, you can break the florets apart by hand, but use a knife to cut big florets into smaller ones no more than 1 1/2 inches thick. While you are preparing the cauliflower, have a pot of water coming to a boil on the stove. Also, get a big bowl of ice water ready. Once the cauliflower is separated into florets, drop the florets into the pot of rapidly boiling water. Let them cook for 5 minutes. Drain the cauliflower in a colander. As an alternative, you can steam the cauliflower for 5 minutes rather than boiling it. Immediately transfer the blanched cauliflower to the bowl of ice water. This stops the residual heat in the florets from continuing to cook them. Leave the cauliflower in the ice water for 3 minutes. Drain the cauliflower well in a colander. Spread the blanched and chilled cauliflower florets in a single layer on a baking sheet. Freeze for 1 to 2 hours. Transfer the frozen cauliflower to freezer bags or containers and label with the date. Frozen cauliflower will keep for one year. It is still safe to eat after that, but its quality will decline. It is not necessary to thaw frozen cauliflower before cooking it. You can use it to make roasted cauliflower, cauliflower rice, or mashed cauliflower as great sides for your meals. 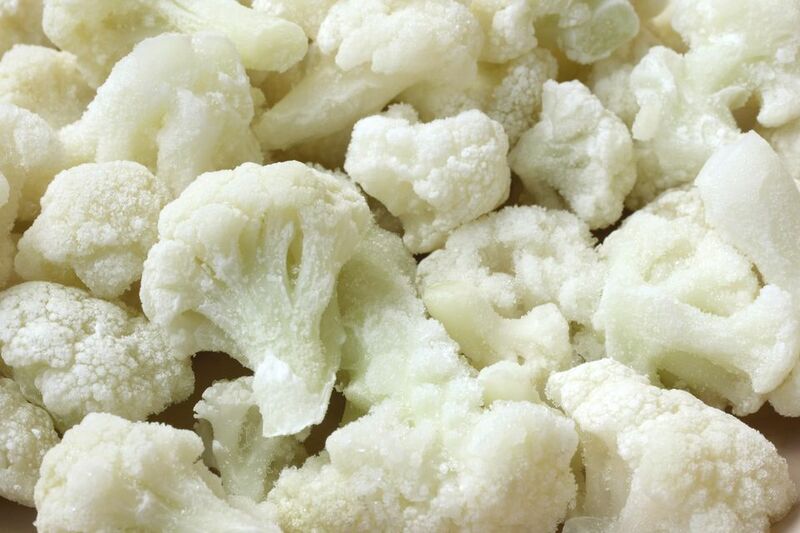 When using a recipe that calls for fresh cauliflower, you can subtract the five minutes of blanching time from the cooking time when you use frozen cauliflower.